I'm so glad to have another guest host here at Come Together Kids. 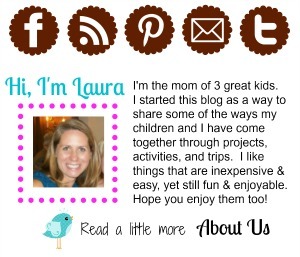 Beth, from Living Life Intentionally is also a mom of three and her blog is just full of tons of great ideas. 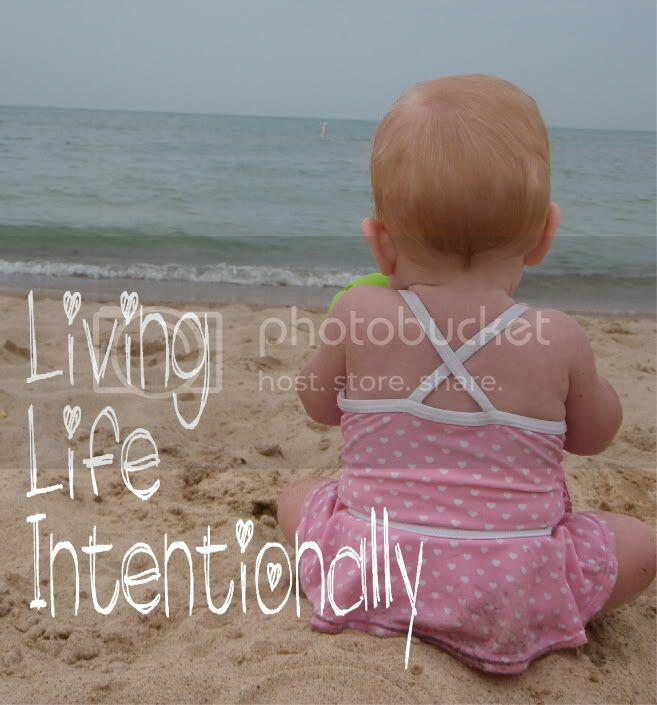 She has crafts, recipes, party ideas, homeschooling lessons and more ~ all organized so you can choose to live your life intentionally without being overwhelmed by the demands of parenthood. This came out so cute I just had to share it with you!!! First, paint your kids hand white (with Acrylic paint, the Crayola washable stuff just won’t cover very well). Put the ornament on your child’s hand and have them put their fingers up carefully. Put fingers back out and pull up ornament. Allow to dry (takes less than an hour!). Hint: If you put the balls on lids it keeps them steady. The painting itself was a lot of fun! We used acrylic paint (we tried several different kinds, but this produced the best results). Minnie (almost 4) was not able to do the detailed painting herself, but she did enjoy painting an ornament freestyle. I put the faces, scarves, arms, & hats on Tinkerbell (1) and Minnie’s (almost 4) ornaments. Didn’t they turn out cute!?! I love that you can see their handprint when you look at it from the bottom. If you look straight on, it just looks like 5 cute snowman on a snowy ground. The 9 pack of plain ornaments was $2.50 at Walmart. Wouldn’t this make a WONDERFUL gift for a grandparent!? ! Plus I am keeping one of each as a keepsake. Here is Goofy’s (6 years old) hand print snowman creation! He did the painting all my himself! I am keeping this ornament for me!! What a precious keepsake!! Even if the fingers get smushed together (like one of Tinkerbell’s) you still make something cute….something like this. Although I’m sure a more crafty person might have some better looking solutions, but it worked for me. Thanks so much, Beth, for sharing these cute ornaments and the fun your family had making them. I'm a sucker for handprint crafts, so I know I'll be making some Handprint Snowmen here with my kids soon. 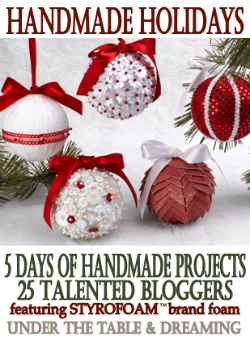 And readers, make sure you stop by Beth's blog to see some of her other great ideas. NOTE: If you're making a bunch of these, I'd recommend dipping no more than 8-10 at a time so the chocolate doesn't harden before you can sprinkle on the coconut. 2. 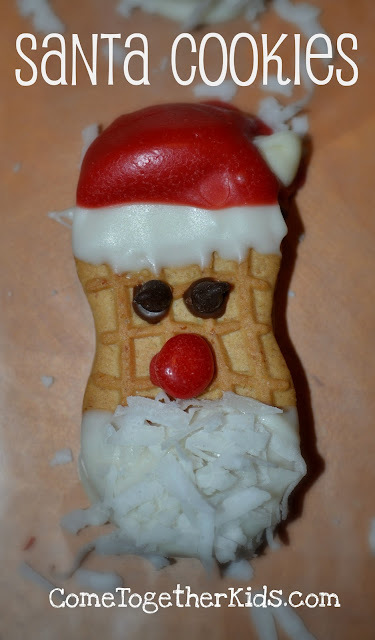 While the white chocolate is still "wet", sprinkle some coconut flakes on the bottom part for Santa's beard. Top and bottom dipped in white chocolate and Santa's coconut beard in place. 3. Let the white chocolate cool and harden while you melt your red chocolate disks. Then quickly dip part of the top in the red melted chocolate, leaving part of the white showing. 4. 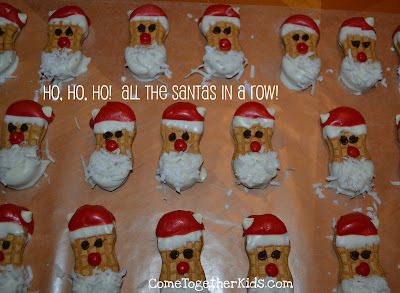 While the red is still "wet", press a white chocolate chip on the side to make the pom-pom on the end of Santa's hat. With the hats and beards done, he's ready for the final touches. That's it! 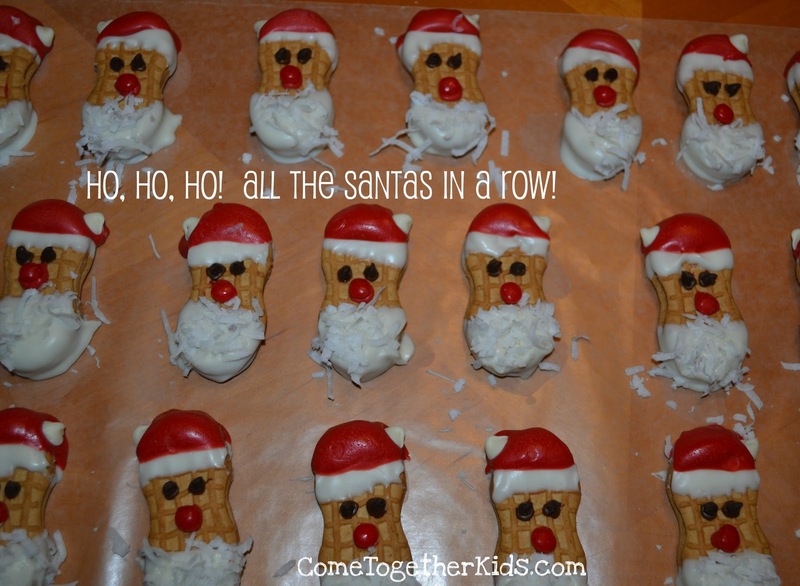 Super cute and super easy (but lots of fun and very festive!). as part of the Styrofoam Brand Foam Handmade Holidays series. in exchange for creating and sharing this project. is that they LOVE to count down to special occasions. they will constantly be asking "How many more days?" a special Christmas Countdown Tree for our mantle. 1. Start with your white block of STYROFOAM Brand Foam, your green fabric and a toothpick. 2. Lightly sketch a tree shape on the white block of STYROFOAM Brand Foam and cut it out with a sharp knife. 4. Now, let's turn this all into a cool looking tree! Take a square of fabric and pinch it onto the end of your toothpick (or sharp pencil, etc.). Then use the toothpick to push the fabric into the STYROFOAM Brand Foam tree shape ~ no glue needed! 5. 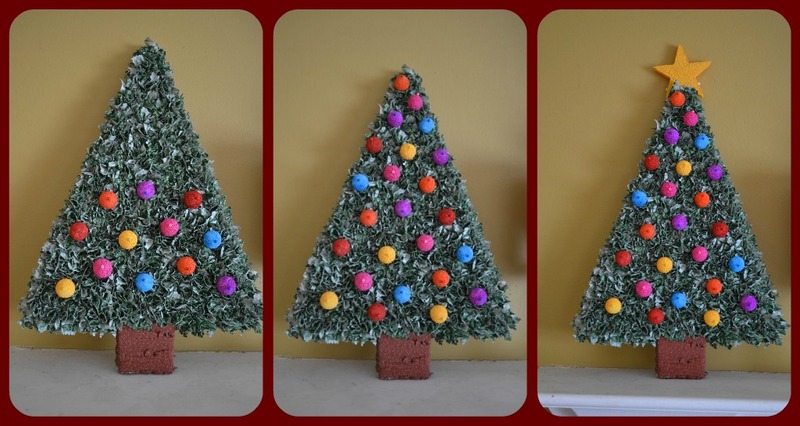 You'll want your pieces pretty close together so they completely cover the tree shape. 6. I just have to share how much my girls (ages 6 and 9) LOVED helping with this step. All I had to do was start the bottom few rows, take a second to show them how to do it, then step back while they finished the rest of the tree! 7. When the front and sides of your tree are completely covered in fabric, cut a few strips of brown fabric for the trunk. (mine were approx 1/2" wide) and wrap them around the trunk of the tree. Just use the toothpick to press in the ends of the fabric to attach it. 8. At this point, your tree looks pretty good. The texture of the ruffled pieces of fabric actually resembles the needles of a Christmas tree. You could easily keep your tree looking just like this and it would be lovely. However, with three kids, I knew I wanted to make mine a little bit more colorful and interactive. 9. To make ornaments, you'll need your 1" balls and 4 1/2" star of STYROFOAM Brand Foam. Using acrylic paints, paint each shape with the colors of your choice. I found that it was super easy to paint the shapes using a foam brush and dabbing the paint on. 10. I debated the various ways to attach the colorful ornaments and star to the tree. In the end, I found that using extra long ( 1 3/4" ) ball head pins worked great. They're long enough to go through the 1" ball and then stick into the tree without going through the back. It's also easy to remove the balls later. 11. 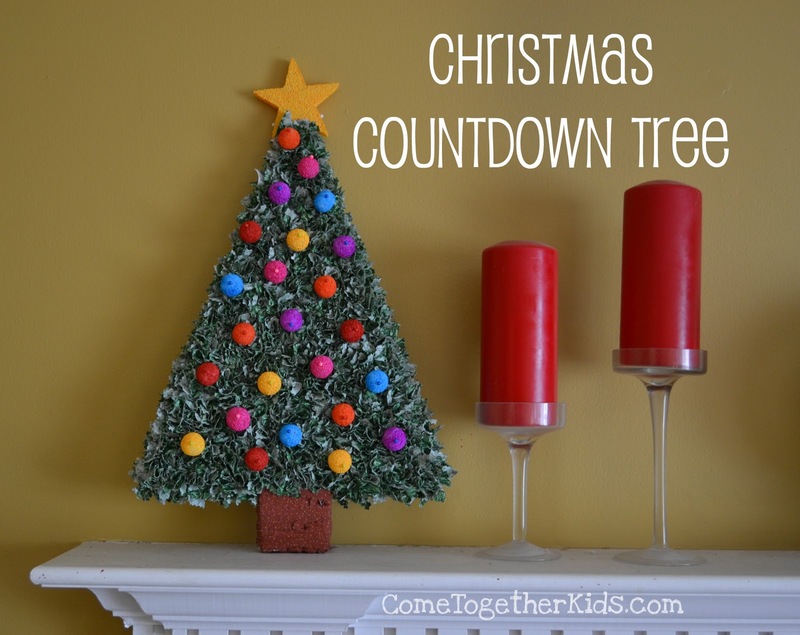 When the month of December starts, we'll take turns adding one of the 24 ornaments each day and then top our tree with the star on Christmas morning. 1. My girls and I loved the texture we created by pushing fabric into the foam. Without a doubt, we'll be using this technique on other projects ~ I'm thinking wreaths and even cutting sheets to make their initials. 2. I was surprised how easy it was to paint the pieces STYROFOAM Brand Foam. I know I'll be purchasing all sorts of different shapes and sizes now and painting them to fit my project needs. 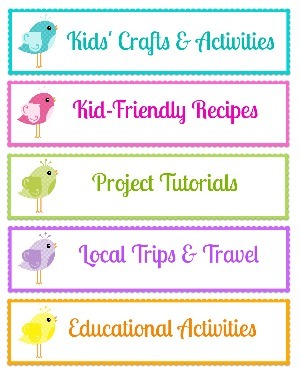 Stop by Stephanie Lynn's spectacular blog to see the rest of the projects created for this series! to help spread that Christmas magic. Don't have a chimney or fireplace for Santa to use? will have no problems getting in to deliver his presents. from Santa himself that is emailed to you for FREE. help keep the Christmas magic alive. in your VERY OWN HOUSE!!! we have with our Elf on the Shelf. that happens at our house every year. 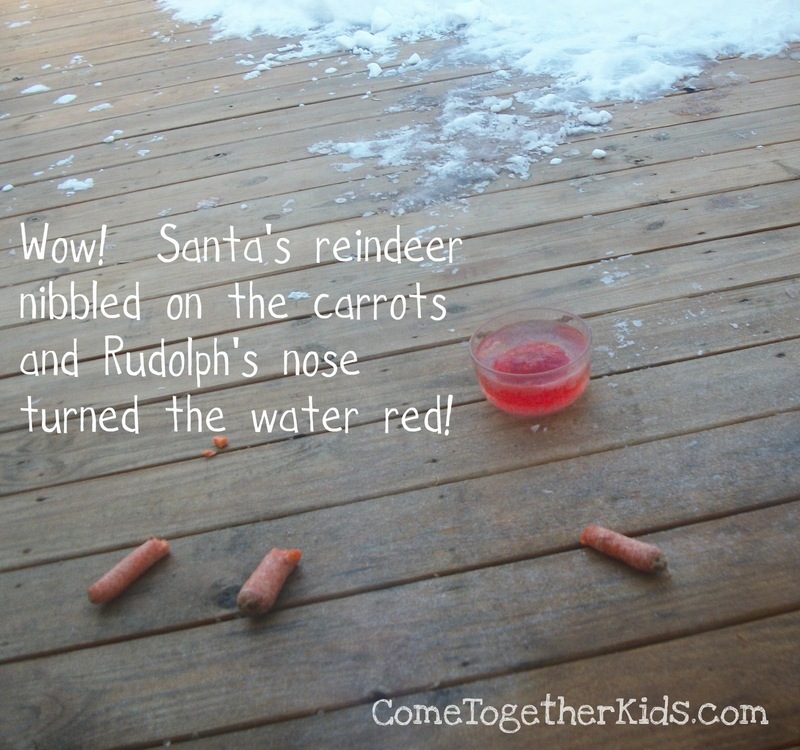 on our back deck for the reindeer. 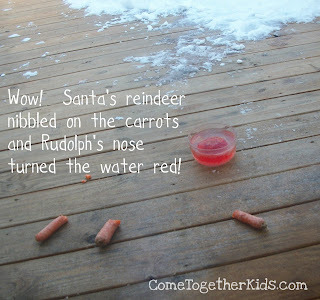 and Rudolph's red nose has tinted the water red. One of those likes is me, so I'm not counting that one! and until your better's best! I don't want to rest here just being good. I want to continue to improve Come Together Kids so it can become better and better, then work some more until it's the best I can make it. Perhaps there's something I can do to make the blog easier to navigate or a feature that might be missing? Maybe you'd like to see more of a certain kind of post or less of another? Okay, I'm done tooting my own horn. Now I'm ready hear your suggestions and advice on how I can make Come Together Kids even better. Today I'm sharing at.. Design Dazzle!